In South Africa, we operate volunteer programs in Cape Town, Stellenbosch, Albertinia, Knysna, Oudtshoorn & Riversdale. Once RCDP receives your application, it will immediately be forwarded to South Africa for processing. Our South Africa, our in-Country coordinator will carefully review your application to ensure you get placed in the project that matches your criteria and qualifications. Once our South Africa in-Country coordinator finalizes and forwards us the detail, we will immediately get in touch with you. The whole process normally takes 1-2 weeks. However, this sometimes takes longer. You will also find an invoice requesting to pay the program fee along with the placement details. Once you receive the placement details, you can call our South Africa office directly and speak to our in-Country coordinator and ask any questions you might have that will help prepare you for the trip. Preparation for South Africa trip includes: reading about South Africa, vaccination, visa arrangement, booking tickets. Should you come across ANY problems, please call our RCDP office. Once you purchase air tickets, you should immediately submit your flight details to both RCDP and South Africa office. All South Africa volunteers are asked to arrive at the Cape Town International Airport (CPT) Cape Town, South Africa. An in-country RCDP representative will be at the airport to meet and greet volunteers. Volunteers must provide flight itinerary as soon as they can, for scheduling purposes. We ask that volunteers fly with all important documents, including personal placement documents, passport, visas and vaccination booklet. Please have these items accessible during travelling. If a delay occurs, including flight delays or missed flight, contact our office as soon as possible. We will obtain a volunteer’s revised itinerary and reschedule pick-up. If volunteers should miss connecting with our staff at CPT, they should arrange a taxi and go on to the office. This information is included in personal placement details. Upon meeting the in-country representative at CPT, will be transferred to the local office and orientation will commence. We suggest South African volunteers arrive one day before project start dates. The volunteer program fee includes expenses beginning of the first day of the project (usually first or third Monday) through to the last day of the program. If volunteers arrive before the first day of the project and/or stay beyond the last day of the program, expenses will be the responsibility of the volunteer (usually $30 per day for room/food in hostel). This arrangement must be made ahead of time as space is not guaranteed. Before departing for South Africa, RCDP International requires volunteers obtain a tourist visa. A tourist visa is an entry permit into the country and is required for travel into South Africa. Your local South African embassy to learn more about the proper steps in receiving a visa, visa fees and visa extensions; or contact our offices with questions. Volunteers are solely responsible for obtaining their South African visa. RCDP International cannot be held liable for delays in the visa process. Visit the sites listed below and acquire as much information as possible. Remember there is no harm in knowing more when it comes to health and safety. Public water is not considered safe to drink in most of South Africa. When traveling to the beaches, drink only bottled or boiled water or carbonated (bubbly) drinks in cans or sealed bottles. Tap water should not be considered safe at the beaches, nor are drinking fountains, fountain drinks (soda pop) and ice cubes. If purchasing pre-packaged water isn't possible, make water safer by both filtering through an "absolute 1 micron or less" filter AND adding iodine tablets to the filtered water. Filters and tablets are found in camping/outdoor supply stores. Buy bottled water from respectable outlets/vendors to guard against an upset stomach. Make sure that the seal of the bottle is intact as it is not uncommon for local street merchants to sell tap water in resealed bottles. The most common health complaint in any developing nation is an ailing digestive system. In many cases, the illness may be attributed merely to a change in diet, but occasional cases of food poisoning can occur, whereby the symptoms occur very quickly, severely and explosively. These are seldom serious or extended illnesses, but medical treatment should be sought if it occurs. Avoid eating food from road side stalls/vendors. Don't eat unpeeled fruits or fruits that have already been cut by unknown handlers on the street. If you must eat food at a place that you have doubts about, make sure the food is served hot. If you require any prescription drugs, bring enough for the duration of your stay in South Africa. They will need to be carried in their original prescription bottle and the prescription must be in your name. It is advisable that you carry a small health kit which should include remedy for upset stomach, some antiseptic cream, hydration powder, deer mosquito repellant, sun block, band aids, etc. We recommend all volunteer/participants visit the Center for Disease Control's website www.cdc.gov for traveler's health recommendations. Your travel doctor will be knowledgeable about current epidemics and should be consulted. See a personal doctor at least 4-6 weeks before travelling to allow time for shots to be effective. 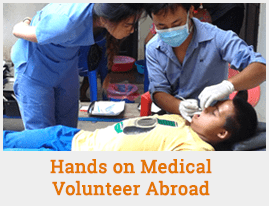 If it is less than 4 weeks before travelling, volunteers should still see a doctor. It might not be too late to get volunteers shots or medications as well as other information about how to protect yourself from illness and injury while traveling. The following vaccines may be recommended for your travel to Africa including Kenya. Discuss your travel plans and personal health with a health-care provider to determine which vaccines you will need. Malaria: if you are traveling to a malaria-risk area in this region, see your health care provider for a prescription anti-malarial drug. With a favorable exchange rate for many international currencies, volunteers usually find South Africa a very inexpensive destination when compared with Europe and North America. And an easy one - financial institutions are world-class, with no shortage of banks, Bureau de Change and automatic tellers. South Africa’s unit of currency is the rand, which is divided into 100 cents. Coins come in denominations of 5c, 10c, 20c, 50c, R1, R2 and R5 and notes in denominations of R10, R20, R50, R100 and R200. The airport offers convenient, international-standard banking, Forex and car rental services. Cash and travelers checks are suggested to settle most accounts. Volunteers will have trouble paying with traveler's checks, but volunteers will be able to exchange them at local banks or post offices. Traveler's checks are recommended as a safe way to carry money with volunteers, make sure volunteers write down the check numbers and contact information volunteers need to cancel stolen checks. Different brands of traveler's checks work better in different countries so consult volunteers local financial institution about which company volunteers should buy volunteers checks from. Travelers should have a credit card for large or emergency purchases. Cash advances at the ATM are simple, yet volunteers should notify their home bank of their intent to travel to South Africa to avoid accounts being flagged for unusual activity. Also, volunteers should confirm their banks’ international ATM charges. The ATM is mainly the Cirrus Network. When using ATM's volunteers are advised to go alone, be cautious and aware when conducting the transaction, travel directly from the bank back to volunteer’s home and to keep cash in a reliable and safe place. When volunteers are carrying cash, break it up into different amounts and keep it in different pockets places on their person in case of robbery. Visa, MasterCard and American Express are accepted in some of the larger stores and hotels in larger cities but may not be widely accepted in smaller cities and not at all in the villages. How much money volunteers bring depends on personal spending habits. Thrifty people can get by on less than $15/day. Volunteers should remember to budget money for free time travel in addition to personal daily use. Once your volunteer program begins, our local staff members stay in constant touch with you. However, when volunteers are staying far from our in-country office, our staff will visit every 2-4 weeks (if possible) and volunteers are always welcome at the office. We recommend that volunteers stop by the office once a week. If your project is located a substantial distance from our offices, then our local staff communicates by either email and/or phone. The internet is widely available in Cape Town. There are many internet cafes that rent computers by the hour and most hostels or hotels will have internet rooms.Please confirm access before you count on it. International phone calling at Private Phone Centers is pay in cash phone calling from widely available locations. The phone facilities are good, but expensive. Volunteers can expect international calls to cost around $1US per minute. Post offices are open weekdays with reliable but very slow service. Try not to mail anything of value, but sending a postcard or letter home is definitely an option, however it may take weeks to arrive! The climate in South Africa is generally warm and dry. In the winter, the temperature only occasionally falls below freezing. In the summer months - December, January and February- the temperature in the drier regions may rise above 40ºC (104ºF). This land of great contrasts includes regions of extreme dryness and tremendous rainfall. The heaviest rainfall occurs along the eastern coastline. As much as 6 feet of rain may be recorded in one year in this region. In the extreme northwest part of the country, in parts of the Kalahari Desert, there is virtually no rain at all. Cape Town is located on the Atlantic Coast and is South Africa’s major seaport. It has pleasant and dry climate most of the year and beautiful beaches. The ocean water is cold and the constant winds create tremendously strong and unruly currents keeping most people from swimming in the ocean. Volunteers should hold a valid passport and necessary documents while traveling in South Africa. Please carry photocopies of passport and travelers checks while in South Africa, to make replacement easy if they are lost. Leave additional copies at home with a friend or relative. These can be faxed to volunteers in an event of an emergency if documentation goes missing. If volunteers are taking prescription medications, please do not forget to pack enough medicine for the entire trip. Various brands of medicines may not be available in South Africa and may require volunteers to see a South African doctor to obtain a local prescription. Normal leather shoes or tennis shoes, which can be easily cleaned, are appropriate for working in the project placements. Volunteers will want light comfortable footwear for evening walks and other leisure activities. Rule of thumb - bring items which wouldn't be missed if lost or ruined. T-shirts, jeans and shorts are common. Bring a bathing suit. Please note that while it may get quite warm during the day, it may get chilly after dark and volunteers may need a sweater or lightweight jacket in summer, and a heavier jacket in winter. It is always useful to carry a small personal medical kit. This should include: Band-Aids (aka plasters), personal medication, fungicidal foot powder/cream, antiseptic cream, mild painkiller (aspirin), tweezers, scissors etc. Do not forget to bring insect repellent and use it often to reduce the possibility of mosquito-borne illness, if volunteers are traveling in the jungle find a repellant with DEET, the more the better. Please do not forget to pack a flashlight, as some villages won't have electricity after dark and volunteers may have to use an outdoor bathroom (at night) at some point. Also pack a camera, film and maybe a personal stereo. Volunteers may wish to bring a diary, pens and pencils and a book to read on the plane. Bring a rain coat during the rainy season. It is a common courtesy to bring a small gift for the staff who will be your hosts. You are not required to do so, but if you choose to bring a gift it can simple. We suggest a box of chocolates, a t-shirt with a hometown/country logo, pictures of your family and local post cards. If you want to bring gifts for your project and if you are working for an orphanage or a school, please bring pencils, pens and paper, art supplies like markers and construction paper pads, as well as games for the children to enjoy. Remember that every child will need these items so you may wish to bring enough for a number of children.